Audio specialist Sennheiser and Full Compass Systems will partner to launch a pop-up audio recording clinic on Thursday, September 11 at the Full Compass facility in Madison, WI. The event will feature renowned, Grammy award-winning sound engineer Leslie Ann Jones, who will demonstrate recording techniques and best practices when recording in the studio, and Wolfgang Fraissinet, president of marketing and finance at Neumann, who will discuss microphone choice and techniques for recording large orchestras. During this event, every attendee will receive a complimentary pair of Sennheiser HD 439 On-Ear headphones. In addition, attendees have a chance to win one of two valuable giveaways: a Sennheiser MK4 large diaphragm studio microphone with shockmount and a pair of Sennheiser MOMENTUM On-Ear headphones. Leslie Ann Jones is the director of music recording and scoring with Skywalker Sound. 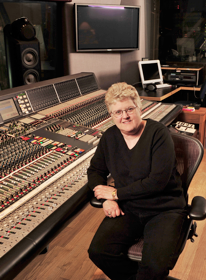 She has been a recording and mixing engineer for over 30 years. She began her career at ABC Recording Studios in Los Angeles in 1975 before moving to Northern California in 1978 to accept a staff position at the legendary Automatt Recording Studios. There she worked with such artists as Herbie Hancock, Bobby McFerrin, Holly Near, Angela Bofill, and Narada Michael Walden, and started her film score mixing career with Apocalypse Now. From 1987 to 1997 she was a staff engineer at Capitol Studios located in the historic Capitol Records Tower in Hollywood. She recorded projects with Rosemary Clooney, Michael Feinstein, Michelle Shocked, BeBe & CeCe Winans, and Marcus Miller, as well as the scores for several feature films and television shows. In 2003, she was nominated for a Grammy Award for Best Engineered Recording, Classical, and received a Grammy Award for The Kronos Quartet's recording of Berg: Lyric Suite, which won Best Chamber Music Album. In 2012, she won a Grammy Award for Best Engineered Album, Classical for Quincy Porter: Complete Viola Works by Eliesha Nelson & John McLaughlin Williams. The event's second guest, Wolfgang Fraissinet, is president of marketing and finance at Neumann Headquarters in Berlin and serves as chairman of the international advisory board of the Deutsches Symphonie Orchester located in Berlin. Since 2005, Fraissinet has been a producer of international music recordings, such as several masterpieces and symphonies from Beethoven, Brahms, Tchaikovsky, Bach, and Mozart. He has recorded a number of Jazz productions, which were produced both in Germany and the U.S. He has also studied classical piano at the Berlin Conservatory. Fraissinet joined Neumann in 1990 and shortly thereafter was appointed as General Manager for the global activities of Marketing and Sales at the company's headquarters in Berlin. In 2010, Fraissinet added Neumann Studio Monitor Systems as a new business unit, which has since gained wide acceptance in the professional audio community, growing year over year since the launch of Neumann's first studio monitor, the KH 120.